The SQL server db.demo.local hosts all databases (Sharepoint, Reporting Services and TFS). The Analysis Services server as.demo.local hosts the TFS cube. 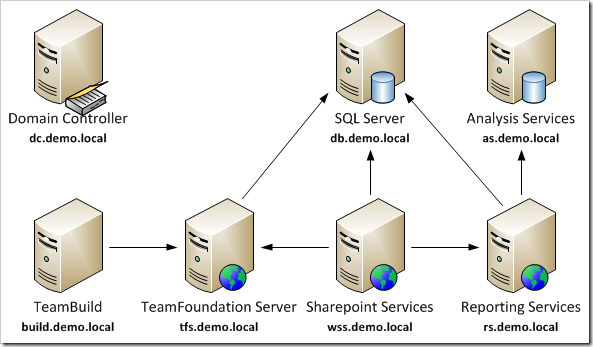 The Sharepoint sites use the domain account demo\wssservice. The TFS services use the domain account demo\tfsservice. The TeamBuild service uses the domain account demo\tfsbuild. This for renaming a DB server for TFS – Yeah you COULD do all that I guess. Or maybe instead just go into your etc/hosts file and add an entry for the old server name that TFS is expecting, and give it the IP address of the DB server. Doesn’t matter if the IP has changed or if you are using the same. This will work as long as you don’t rename the collection. You are right that you can change the host file. You can even add DNS aliases. I was going to add a conclusion when i finally got time and explain those other possibilities.